Like several of my other recent reviews, I've held on to the most recent release for Chicago's Palaxy Tracks while I figured out what to say about it. The first thing I discovered long ago is that Cedarland is a very good album. But that doesn't tell you much about them. What type of music do Palaxy Tracks play? What do they resemble musically? And, finally, what makes this album special? 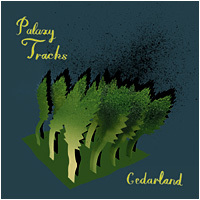 Original;y from Austin, Texas, Palaxy Tracks relocated to Chicago a couple of years ago. I haven't heard any of their earlier material, but I can suggest that Cedarland manages to combine the sensibility of both their old and new locales. Although each song on the album could be analyzed in detail, a discussion of a few of the tracks ought to explain my meaning. For instance, the first song, The Sediment, begins with the slightly complex rhythmic drumming that seems to be a hallmark of The Chicago Sound. However, over this a somewhat chorused guitar plays a simple but catchy guitar riff that evokes the same dreamlike quality of a Texas band like Knife in the Water. Then after a while, the vocals of Brandon Durham come to the forefront. Still the song turns out to be very mellow and the simplicity of the song suggests that there were fewer musicians than the 5 credited on the track. After that comes my favorite song on Cedarland, The Wasp. Quicker-paced and more guitar-driven than The Sediment, The Wasp seems like a typical post-punk Indie Rock track. I especially like the way the rhythm guitar and drums combine into ostensibly one musical part. Driven again by the omnipresent drums, this song could easily be performed by one of those other Chicago bands I've recently reviewed, like Taking Pictures. I suspect I see this resemblance because both bands have the same musical mixture of driving drums with effects-laden stringed instrument. In contrast, the third track harkens back to the Knife in the Water comparison. More energetic than the songs of that Texas band, the soft country-influenced melody of Walking Backwards also is reminiscent of early Wedding Present or perhaps a band like Red House Painters. It's a nice background track that's very impressive, with a particularly sweet guitar part in the middle, which then flows into a standout piece on the violin. It's not a very heavy sound, but again it does invoke a sense isolation in its musical landscape. Another standout track on Cedarland is Posthumous. With the near martial, tom-and-snare heavy drumming of Joe Rowsey again at the forefront, the song can't be called alt.country by any means, despite the presence of dueling slide guitars. Instead, like the time I saw Carissa's Weird in concert, the slide guitar is played like a real guitar instead of as a country accent. This gives Posthumous a slightly haunted feel, which is increased by the backing guitar rhythm. Nevertheless, the combination of the drumming and instrumentation and the focus on the guitar invokes the chilliness of their Chicago brethren and recalls more a band like Midstates as opposed to a Southern band like Bedhead. Finally, the last outstanding track on Cedarland, The Awful Truth, begins again in a slow tone. For once, the drums aren't my central focus; rather, the chorused guitars reflect the vocal melody and bring everything together. More importantly, as The Awful Truth moves into its instrumental middle, more and more instruments enter into the song. These remain under-stated and not prominent but still present as the music begins to swell. Then the original melody is carried by these numerous other instruments, so that the lack of Durham's vocals aren't even noticeable as the song continues out to its over 8 minute length. This is the one song that particularly emphasizes to me the wintriness which colors Palaxy Tracks' music. The sheer isolation and slightly-melancholy feel invokes the stark beauty of the Midwest in winter, as the snow covers everything and there is little life in sight as you look out over the barren fields. When I first got a copy of Cedarland, I had a hard time figuring out what to make of the Palaxy Tracks, mainly because it's not the harder garage rock I normally adore. However, as I continued to listen to the album, I realized that it has everything that I do like: it's got a compelling vocalist, some simply beautiful guitar work with under-stated effects, and everything's all held together by the drumming (which seems to be the glue of so many Chicago bands). Furthermore, because of its more mellow moments, it's easy to overlook how perfectly crafted the music and melodies are. However, with repeated listening and further reflection, I've come to the conclusion that Cedarland is a near-perfect Indie Pop album.